Tossing a communion cup on a one-foot hop. Spinning a budget, now what will I drop? But I ended up falling on the devil’s stick. 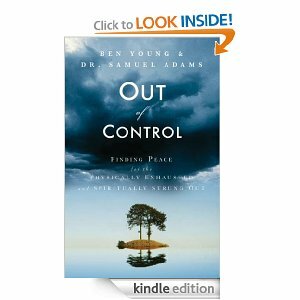 Ben Young & Samuel Adams’s book, Out of Control, has a very long subtitle: Finding Peace for the Physically Exhausted and Spiritually Strung Out. But the subtitle is accurate. They describe how our culture is out of control because rather than letting the greater efficiency afforded by technology such as cell phones and computers give us more time to rest, we have instead tried to cram even more activity into shorter time. Young and Adams describe seven symptoms of an “out of control” lifestyle: out of shape (physical), out of sorts (emotional/mental), out of touch (relational), out of time, out of focus, out of balance and out of order (spiritual). Then they confront the lies that keep us out of control, particularly the idea of pleasing the world to be successful and the idea that getting rest is laziness. The rest of the book takes a pleasantly surprising turn, as it is NOT another “how-to” book with seven easy steps. Instead, they dig into the spiritual disciplines of the Bible, and encourage the reader to practice a real “Sabbath” and take time to unplug completely from technology in order to practice the other spiritual disciplines of solitude and prayer. This book influenced me to become more serious about unplugging from technology for a large portion of the day on my day off in order to spend more authentic time with God. It was a truly rewarding experience that I pray I will continue to explore for a long time to come.